A certain amount of tension helps us grow. A physical, emotional or intellectual challenge can push us to excel. But how much challenge is too much? When does a challenge become deadly stress? Each of us has our limits. Unavoidably, stress happens. What’s the best way to deal with it? And how does one reduce its damaging effects? Perhaps just as important, how does one convert a stressful situation into an empowering one? But how important is this topic? What is lost if we do not assess and address this subject? The following reasons drive home the importance of this issue and the need to learn more about it. 1. Stress kills. When you feel emotional stress, the body produces certain chemicals like adrenaline. These help in the more primitive “fight or flight” scenario, but not so much in the modern office where such actions are inappropriate behavior. These chemicals can be detrimental to your health over time, leading to debilitating problems like heart disease. 2. Stress can lead to greater susceptibility to illness. 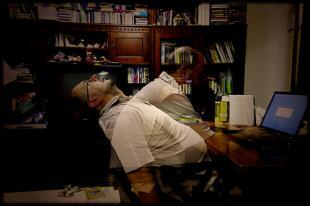 Too much or “chronic” stress can reduce the body’s ability to ward off illness. And don’t you have better things to do with your life than to take off more sick days? 3. Stress can result in hair loss. If you’re already bald, then no biggy, here. But for those who like their full head of hair, stress-related hair loss can prove devastating. 4. Stress can contribute to diabetes. And you don’t need the stress that comes with that major illness. 5. Stress can contribute to obesity. It’s ironic that one of the more potent methods for combating stress is that of exercise and such physical activity cuts down the chances of obesity, too. 6. Stress can lead to ulcers. And what a pain that is. More pain, more stress. This turns into a vicious downward spiral. 7. Stress can lead to depression. Besides the obvious psychological factors, including the perception of insurmountable problems, the detrimental effects on physical health add to the overall general feeling of being burdened by the world-at-large. The workplace is stressful enough without adding health and emotional problems on top of it all. That’s why many large companies include stress management training as part of their overall corporate training program. Perhaps not surprisingly, the least stressful method for achieving compliance on such education is to provide it in the form of online training courses. The convenience of such elearning is sure to add very little stress compared to the overall benefit.